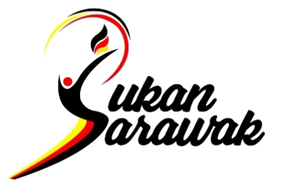 The design of Sukan Sarawak (SukSar) logo is unique and interesting as it symbolizes the local athletes' commitment and perseverance in achieving the common vision of making Sarawak a sports powerhouse in Malaysia. The emblematic "S" symbol illustrates the high level of sportsmanship while the human-like form holding a burning torch demonstrates the persistence and courage of the local athletes who compete in sports and games. The design of a person-like in jubilation also symbolizes the exciting atmosphere and excitement of all athletes participating in SukSar Games who are energetic and youthful.The three colors chosen in the SukSar logo design also represent the official colors of Sarawak which are black, yellow and red.